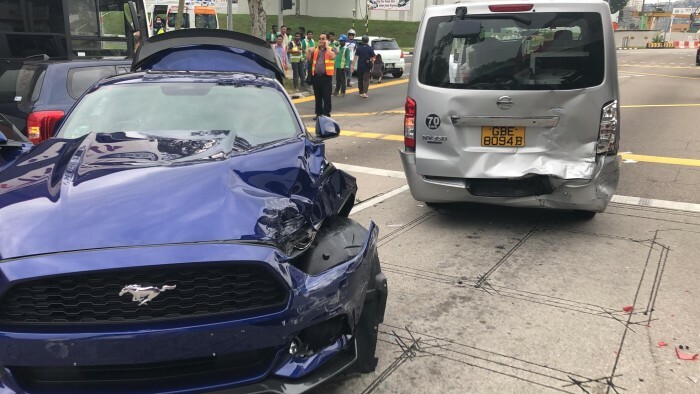 Three people were taken to hospital after an accident involving 6 vehicles occurred along Upper Thomson Road on Tuesday (July 31) afternoon. 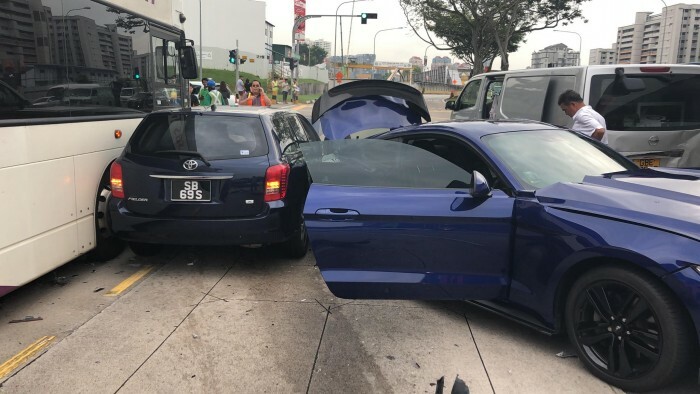 The police told Stomp that they were alerted to an accident involving three cars, two buses and a van along Upper Thomson Road towards Sembawang Road at about 3.08pm. In photos posted to the Singapore Taxi Driver Facebook group by Cabby Tan and Lim Lian Chin William, one of the vehicles involved was a blue Ford Mustang. A police spokesman said that three persons, aged between 54 and 72, were conscious when taken to Tan Tock Seng Hospital, including a 54-year-old male driver of one car involved in the accident. A 72-year-old man and a 58-year-old woman in another car were the other two injured persons. In the photos, a Toyota car is seen wedged between a double-decker SBS bus and the Mustang. The Mustang's left headlight is badly damaged. A silver Nissan van's rear bumper also appears to be damaged and several car parts are seen lying on the road. According to William, the Toyota driver failed to stop when the other vehicles were already stationary at the time of the collision.